SUMMARY: Seventeen-year-old Parker Frost has never taken the road less traveled. Valedictorian and quintessential good girl, she’s about to graduate high school without ever having kissed her crush or broken the rules. So when fate drops a clue in her lap—one that might be the key to unraveling a town mystery—she decides to take a chance. 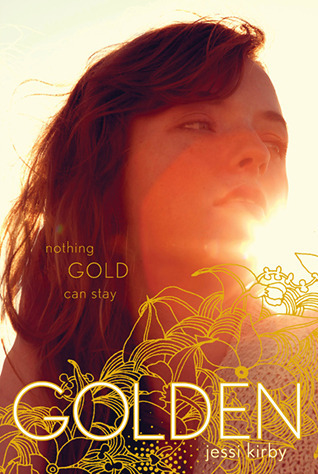 OPINION: Beautiful, tragic, emotional and memorable, Golden is the perfect blend of coming of age, romance, mystery and friendship. This is everything I love in a “what the heck am I doing with my life?” and finding myself book. With both Parker’s story, and that of Julianna and Shane’s through the journal, mixing together and overlapping, Kirby’s talent truly shines in this stunning book. Parker is an amazingly well done character, a girl who goes through such tremendous changes. Some of her bigger shifts, though, come in stages, and though the overall timing of them is relatively close together, she still takes a breather between each incident. This is something I truly loved in this book, and in her. There is so much that is relatable with her, yet she stands on her own in this great way. Her mother is overbearing, the kind of mom who has such high standards and expectations for her daughter, anything else is not really an option. It’s also the sort of blind expectation, where she doesn’t see the impact it’s having on Parker. Parker didn’t just instantly become spontaneous, and though she had a few fly by the seat of her pants decisions, there was a bigger sense to it too, like she was looking at everything ahead of her now in a different way. The story with Julianna and Shane is one of my favorite elements of this book, rapt with emotions and pain. I cared as deeply about these characters, despite already knowing they were dead, as I did Parker, Trevor and Kat. I loved the fact the town pitched them as this golden couple, yet the journal told a different sort of story. Julianna was a girl who forged her path alongside Shane, rather than in spite of him, and without giving anything away, I completely loved the things that started to make her realize and question that. It wasn’t that she didn’t want Shane anymore, but things did come up that certainly tested her. The parallels of that, to Parker, also, was woven between the lines in this great way that kept me so hooked. Then there’s Trevor, charming, endearing, flirty, and solid. He’s done a few things I lifted a brow at, yet he’s just so there for Parker. He has this obvious thing for her, yet because of his flirtatious ways and his tendency to mess around with a lot of girls, Parker keeps her distance in that regard. He was far from a doormat despite his feelings for Parker, but he didn’t walk away over little things either. He was that perfect blend of friendship and waiting to be more, and this boy completely melted me. I loved the plot of this one, and though it had some great twists in it, most notable for me was Parker’s character arc and journey. She goes through some big things, both personally and in the things she experiences, and Kirby utterly nailed everything about it. In truth, much of what got to me about this book is impossible to explain without spoiling, but it's a book that has stuck with me. With Parker’s mom so easy to point fingers at, yet something stronger thrumming beneath her, and a great sense of self arising in Parker, this is exactly what I love in a contemporary book. Add in the stunning writing and Kirby’s knack for voice and luring readers right in, and Golden is a brilliant, aching must read of a book.